Lou-Tec is a unique network in Canada. 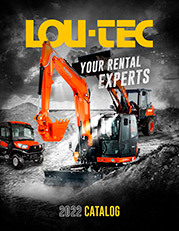 Our mission is to offer the best service and a full range of quality and safer products for the rental of heavy machinery, equipment and tools through a network of 80 affiliated and corporate stores that are performing and leaders in their markets. Entrepreneurial culture, innovation, service and solidarity are values ​​that led to the Lou-Tec success. If you share the same values ​​and the rental challenge interests you, contact us.